Overt patriotism has not been politically correct in the past few years in the UK. No flags in schools or rousing choruses of the national anthem…….I will bet a lot of young people do not even know the words! Not least of all because extreme right wing factions have hijacked the Cross of St George, English flag….. 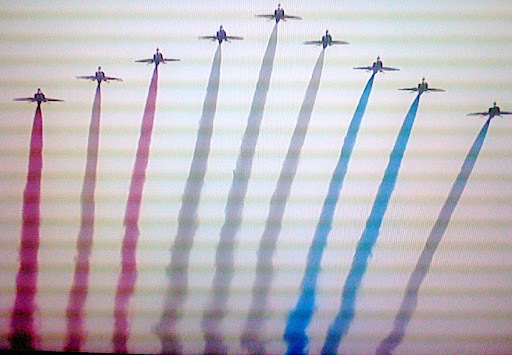 But I think the Jubilee celebrations have given people a sense of being British and a united us in that. Ironically the republicans have had a voice throughout this Jubilee, during the coverage. There have been discussions on TV and republicans have been allowed to protest, but their voices have been completely drowned out by the Monarchist majority. I think if they had an election for ahead of state today, the Queen would win hands down. The three day Jubilee celebrations have certainly made me proud to be British and maybe I will wave the flag a bit more often. The water pageant was a bit of a wash out, but a glorious reflection of how we carry on regardless and a good example of how TV reporters desperately tried to convince us of how “exciting” it all was. The concert was a huge success, my favourite bit was when Madness were performing on top of the palace and images projected onto the palace turned it into first a block of council flats and then a row of terraced houses.. It also showed us how ageing rock stars who shall be nameless, (but they have titles,) should really retire…..somebody should tell them! …Full marks to Tom Jones who made his performance a sing along. …and somebody should really have explained beforehand to Stevie Wonder that it was not the Queens 60th birthday! My sympathy went out to the poor girl from St Johns Ambulance who led the prayers and started reading from the wrong page….. embarrassing silence! ….she kept it together though and quickly corrected herself.. Then lunch at the historic Westminster hall, marching bands, carriage processions, 60 gun salute. Balcony appearance, fly over and at the end a moving TV appearance by the Queen on TV. Unbelievably well organised ceremonial, which I have to say I think the British do so well. If you just watch the way they safely allow the crowd to approach Buckingham palace down the Mall, it is a brilliantly clever exercise in crowd control.
. I also learned quite a but of history, from the ITV commentary from historian Dr David Sarkey, for whom it all became too much and he burst into tears,…. not before he had called Nicolos Sarkosy a “nasty jumped up little spiv” and the new president, Franciose Hollande , “a second rate provincial schoolmaster”…... I just love these British eccentrics! do you think he will be invited back? LOL! Just something I would like to know though…I wonder if the ladies, confer and co-ordinate the colours of their outfits? Previous post ← HEROINES OF THE DAY. I agree wholeheartedly with Jo, you are right to be proud, Denise! And that's coming from a renegade American who was moved by the Queen's speech.One question if you don't mind – how did you feel about seeing Camilla in so much of the coverage. Is she widely accepted by the British now?I wish that I would have heard Dr. Sarkey's comments. I can't imagine what provoked him to make remarks about Sarkozy and Hollande when the subject was the Queen's Jubilee. Jo, I agree that Kate the Duchess of Cambridge does look VERY thin. I don't know if this is natural, her mum is also very slim, or whether it is pressure that makes her so, (which would be sad) but she noticeably lost weight after the engagement and never regained it.. On the other hand Princesses Beatrice and Eugenie manage to be curvy and beautiful at the same time.Mary Kay…The fact that Camilla was sitting next to the Queen and obviously gets on well with her, is a sign that all is forgiven in the Royal household. Also the Princes Harry and William seem to accept Camilla, and they are aware of all sides, so I think the country should do too.However, Michael and I were shocked at a barbecue on Saturday at the strength of feeling of one of the guests and the personal insults he threw at Camilla were unprintable….Amazing how people think they know so much about people they have never met. Personally my feeling is that it was a love affair that lasted the test of time and only stupid Royal protocol got in the way. If she could have married Charles in the fist place, history would be different. Only the fact that she had "been around a bit" prevented Charles marrying her at the time. I think she is good for him and why shouldn't he be allowed to be with the woman he loves so obviously, like any other man in the country? Given the longevity of the women in his family, the likelihood of him being King for any length of time, if ever, is slim. So for me Camilla ever being Queen is a non question. They are both in their sixties. Good luck to them I say.I greatly admire Prince Charles for standing up to the establishment and marrying Camilla when he did, (after some snub or other) as she was STILL not popular at the time. I think the whole sad business with Diana, and the lessons they learned, changed the modern Royal families attitudes and made than more in touch with the people. This is Diana s great legacy…William would never have been allowed to live with Kate before marriage or marry Kate a generation ago.The whole business with Diana was sad and unfortunate. People make mistakes and behave badly. As we have all made mistakes who is to to judge. As I said before his children have forgiven him so maybe the public should do so as well.As to Dr Sarkey…he is a very good historian, but outspoken and a terrible snob! His remarks were made in a discussion about our constitutional monarchy vs a republic….ie. look what happens, you get these awful people as head of state! I can't remember what he said about the US president, probably something equally as insulting.Love Denise. However his views were very relevant as I am not sure if people abroad understand that the Queen does not exercise political power, yet in that, keeps the balance of power in this country. Thank you for your marvelous comments and coverage of this event! Being of 3/4 English blood, I am most interested in it all ….and maybe Queen Elizabeth (reign of 60 years at age 86) will reign longer than Queen Victoria (who reigned for 63 years but passed at age 81)! Queen Elizabeth seems in wonderful health although we could see she was understandably concerned about her dear husband during the concert. I love the hats too! 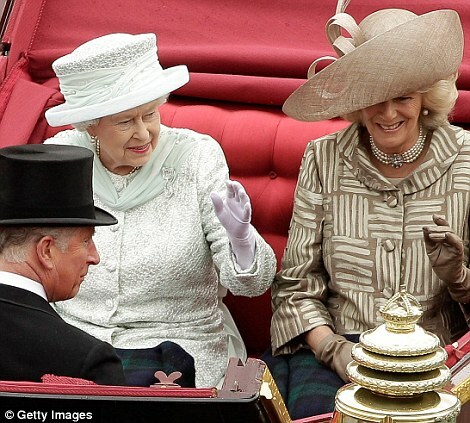 Eugenie and Beatrice's hats are fun as well as their British fingernail polish! Denise, Thank you for the in-depth answer to my questions. Like you, I had the feeling that Camilla's placement next to the Queen during so many events signified that she has been welcomed into the family but wasn't sure how it would be viewed by the general public. When I saw Charles and Camilla laughing and obviously enjoying each other's company, I also thought that he should have married her in the first place. As you said, they've learned a lot of lessons over the past years.Thanks again! Thanks, Denise for all your comments regarding the Jubilee celebrations – I thoroughly enjoyed every minute that I got to see on TV – even skipped a gym class one morning so that I could watch the procession back to Buckingham Palace "live" – I could just envision you, Mez and myself on our blankets eating our picnic lunch and watching the events on the big screens – although, this time we may not have been so comfortable with all the rain!! I do greatly admire the Queen and all she stands for and for the way she has conducted herself in her role these last 60 years – even though I'm not British, I'm very proud for all of you who are!